Organoids represent one of the most promising and most rapidly evolving tools in scientific research, particularly in the field of oncology. These three-dimensional (3D) complex structures are derived from live patient induced pluripotent stem cells. Using cells from the organs of living patients, organoids are grown in vitro in a defined culture medium to resemble whole organs. These organs, or organoids, are then used to test drug effects and efficacy, evaluate organ regeneration and renewal, and assess the various mechanisms underlying countless disease states. As a 3D model of an organ, organoids provide a more accurate analysis of in vivo biological processes such as gene mutations, organ damage, and tissue renewal, and often this model can assist in developing personalized disease therapy. In medical research, organoids are typically used as a complex model system of human disease. This system can be studied to improve understanding of certain disease types, specifically cancer. Researchers will often systematically insert common cell mutations within the model system to differentiate between critical driver mutations that initiate cancer development vs passenger mutations that are generally irrelevant to the overall carcinogenic pathway. Thereby, gene editing of organoids can provide insight into the number of genetic mutations required for cancer development. 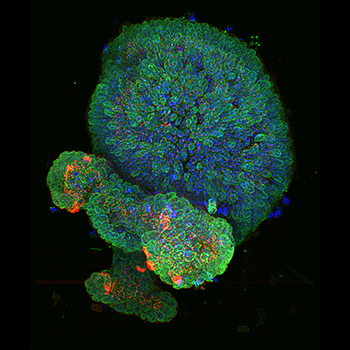 Research has demonstrated that single mouse Lgr5+ stem cells can expand into epithelial organoids in vitro, and that progenitor cells (PCs) that appear near bile ducts after liver damage can be clonally expanded as organoids over a period of many months. PCs can also differentiate into functional hepatocytes both in vivo and in vitro and improve animal survival. Bile duct cells in humans can be expanded into organoids in vitro as biopotent PCs and then translated into functional hepatocyte cells during transplantation. According to a 2015 paper published in Cell by Marc van de Wetering (Hubrecht Institute) and colleagues, organoids provide a variety of benefits for the scientific landscape including their ability to demonstrate gene-drug associations in disease treatment. Organoids may also ultimately aid in the development of personalized medical interventions. For example, tumor tissue from cancer patients can be used to create cancerous organoids, sometimes referred to as tumoroids. These tumoroids can then be used to test the sensitivity and resistance of various cancer drugs, hopefully resulting in an individualized therapy based upon the results observed in the tested tumor tissue. Organoids have been used to evaluate the physiological mechanism that occurs during liver and kidney development and regeneration and to discover methods for developing a functional organ in vitro. Organoids are also used to study tissue renewal and regeneration, particularly in the stomach and intestinal lining. A paper from a 2015 publication in Nature found that it was possible to form a complex multicellular kidney organoid with fully segmented nephrons (>500 nephrons per organoid). 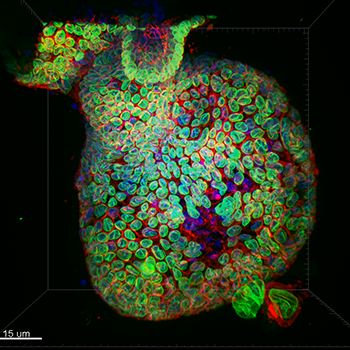 This organoid may be helpful for future nephrotoxicity screening and disease modeling. In cultured cells, liver organoids feature significant long-term maintenance of genomic integrity. Since an organoid system requires no need for genetic modification or reprogramming factors and also presents no malignant conversion upon transplantation, organoid cultures may provide a safer source of hepatocytes for transplantation. Furthermore, liver organoids may help drug researchers determine the toxicology, pharmacology, and hepatic toxicity associated with various drugs used to treat liver diseases. Utilizing laboratory-grown organoids in liver cancer research can be a helpful method for determining cancer treatment efficacy. Newly developed drugs for the treatment of cancer require extensive testing to evaluate potential drug-related hepatic toxicity in patients. Specifically, 3D tissue organoids that are derived from living human cells can be inoculated with carcinogenic cells to create liver-tumor organoids for demonstrating liver metastatic growth. Then, this model can be used to test the response of liver tumor cells to new and/or existing anti-cancer therapies. Confocal imaging devices are necessary for in-depth evaluation of organoid morphology and behavior. Imaging of organoid structure requires a system that provides flexibility in imaging magnification, illumination, and mode while also improving data acquisition speed. 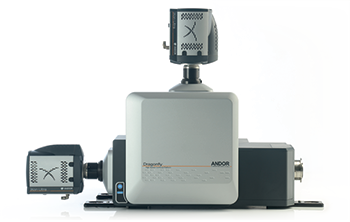 Dragonfly is the newest high-speed, multi-point confocal platform from Andor. This is a multi-modal instrument providing exceptional imaging performance with rapid, real-time visualization for specimen evaluation. Modes include confocal, wide-field, and simultaneous dual color TIRFM which assists in exploring in vitro and in vivo specimen biology. The system provides greater wavelength range, features improved uniformity in visualization, and helps researchers simplify workflow when visualizing organoids in the laboratory. Additionally, Dragonfly is used in conjunction with Andor’s Fusion software to reduce complexity and improve the system’s ease of use. Dragonfly can capture images in a 16-bit dynamic range confocal images at 400fps and additionally achieve both low and high signal detail in a single capture. Dr Luke Boulter, Leverhulme Trust-Chancellor's Fellow, Principle Investigator, MRC Human Genetics Unit, Institute for Genetics and Molecular Medicine, University of Edinburgh.